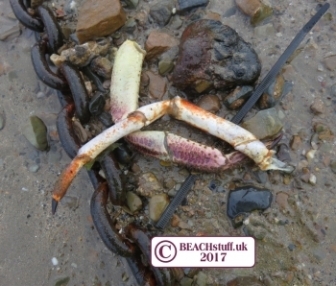 Many of the crabs we find on the strandline are already dead or are the moulted shells discarded by growing crabs. 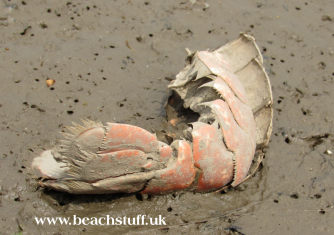 Moulted shells are generally lighter than actual crabs but otherwise appear almost identical. 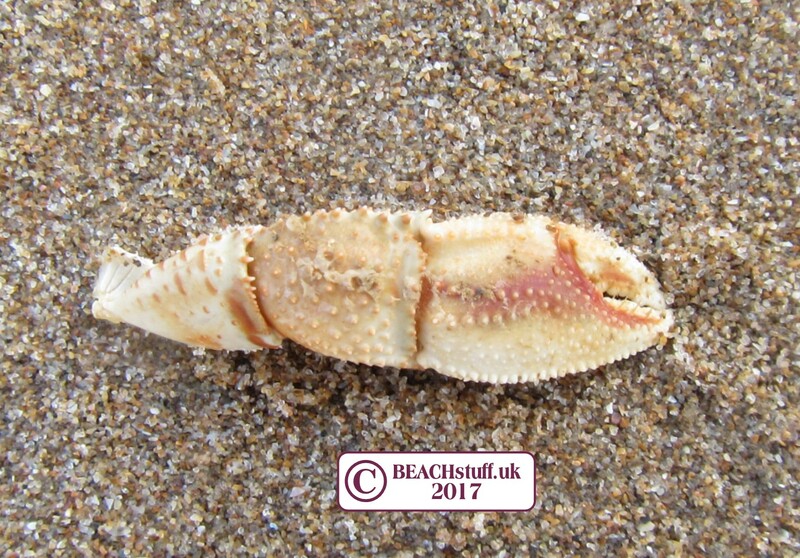 Sometimes, we find only pincers, legs or the top part of the crab's carapace (shell). See our gallery below for help with the identification of these separate bits and pieces. 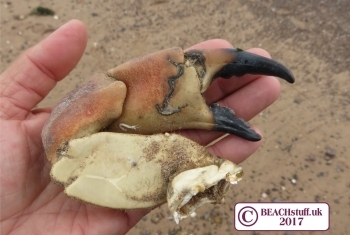 These are the main crabs you are likely to find on the beaches of Britain. 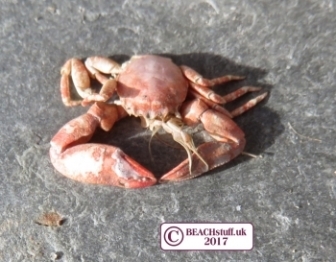 If you do find a live crab, the best thing that you can do for them is to get them into sea water, pereferably in the relative calm of the deepest rock pool you can find. They will then try to find shelter under a rock or dig themselves into the sand. If you cannot find a rockpool, dig a shallow hole and place the crab in the damp shade inside it. 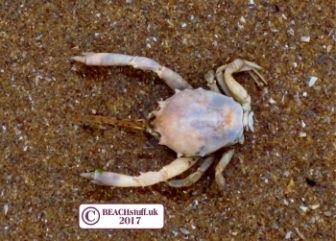 This is our most common rock pool crab. Generally have a shell of about 2 to 10 cm wide. Comes in all sorts of colours - often greenish - but can be patterned and may be bleached in the sun. It is identifiable by its almost heart-shaped carapace. 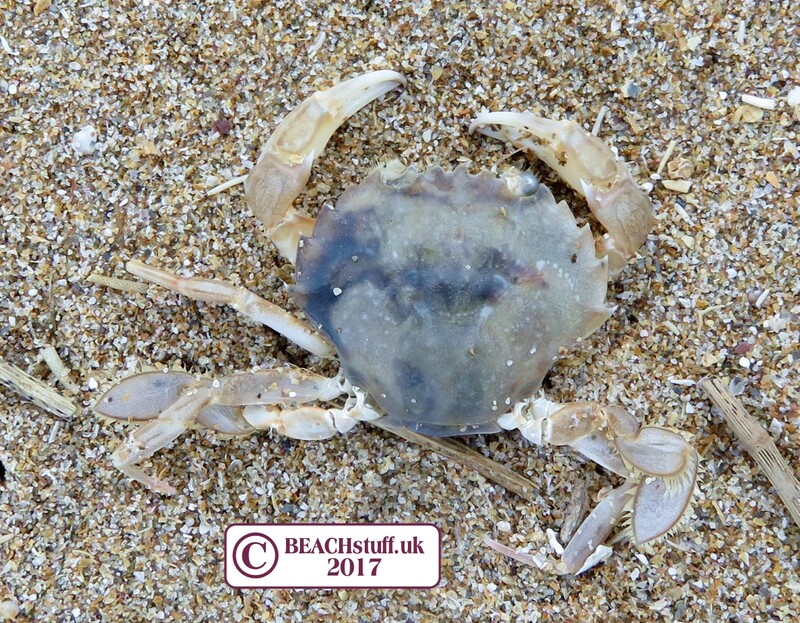 The carapace is round and domed but may be so covered in seaweed and barnacles (the way the crab camouflages itself) that it can be hard to spot. Their long slender orange legs can be a give away though. The crabs often live in large communities just our to sea. The bodies of the spider crab can grow to be as large as a dinner plate. 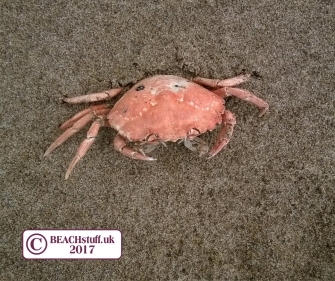 This moulted spider crab shell was carrying not only a large collection of crenate and wart barnacles and keel worms but it sported a dapper hat of whelk eggs. 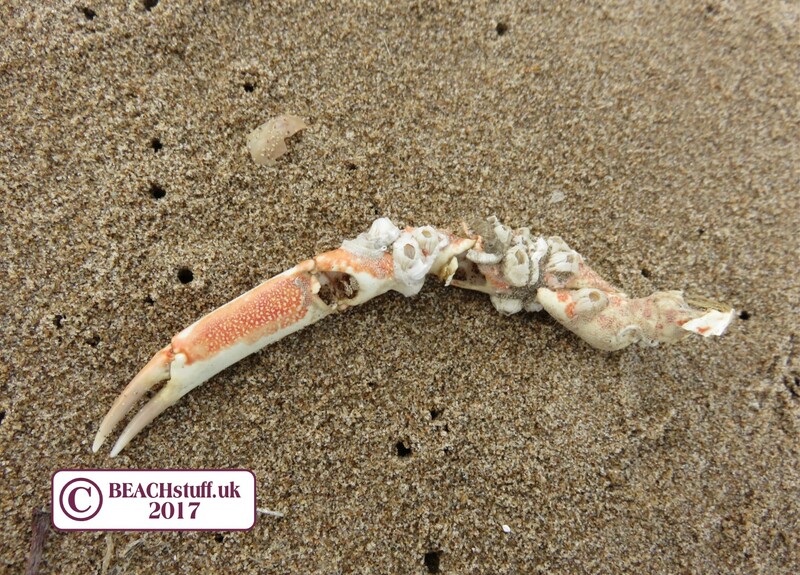 Rescuing a spider crab from the strandline. Often they are already dead by the time we find them but this one moved a little so I thought it was worth running down to the water's edge with him. 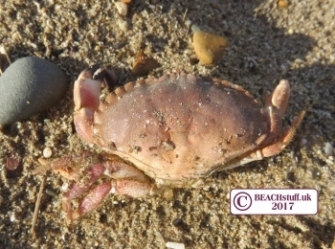 Not only is this crab given the name 'edible', it also has the misfortune to look a lot like a Cornish pasty - a toasted brown colour with nicely pinched pastry edges. 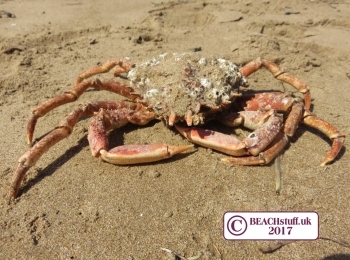 In an English seaside restaurant or chip shop, ordering crab more than likely means that it is this crab that you will be served. In France, spider crabs are more the more popular crab dish. Edible crabs are quite shy and live hidden in our rock pools. 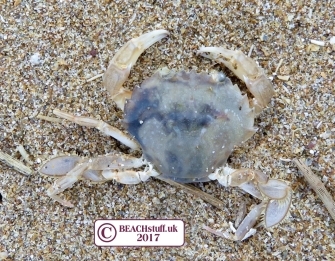 The white spots on the carapace of the Pennant's Swimming Crab are a good way of identifying it. 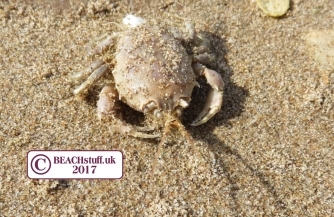 It has flattened back legs which help it to swim but which are also good for digging backwards into wet sand where it likes to hide - have a look at the video below. Compare these back legs to the ones of the shore crab or spider crab above which are pointed and thus far better for grabbing and holding prey. 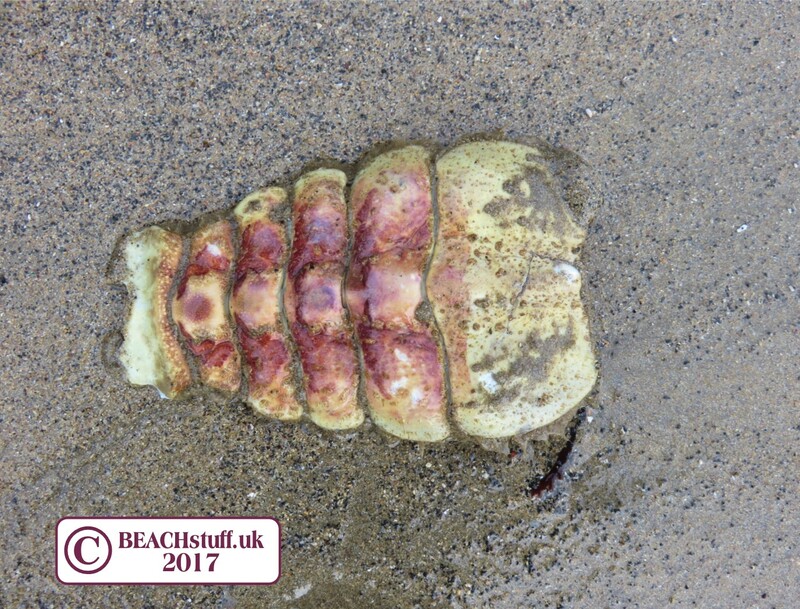 Rarely seen alive as it lives buried in the sand with only its antennae at the surface of the sand. With these, it can draw down sea water enabling it to breathe under the sand. The males have these long pincers shown on the left while the females front claws are pretty short as in the photo below. This fabulous-looking crab looks very exotic but it is actually not uncommon on the west coast of Scotland and Wales and southern England. I've only ever found one of these and sadly it was dead, although perfectly preserved. They are small, only about 1cm across. The Columbus Crab, thought to have first been seen by Christopher Clumbus, arrives clinging onto Goose Barnacles. Having travelled the oceans, it must be confusing landing on our beaches. Very small (around a centimetre wide), their bodies are almost square. 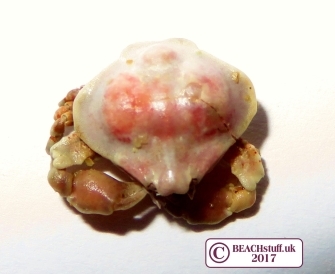 In comparison with the Common Spider Crab,this is a very small crab, the carapace only reaching 2cm in length. 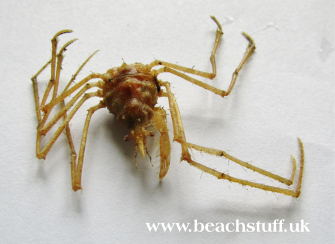 Like the Common Spider Crab, it gathers seaweed on its shell and legs which serve to enable to hide effectlvely. I have found a few of these stranded on sandy beaches but they actually live at sea, beyond the usual low tide level. 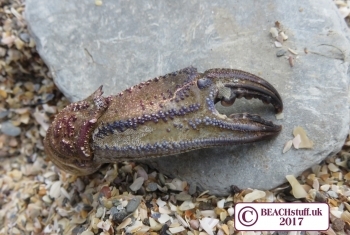 They bury themselves in sand with often only their huge oversized claws showing. This is a useful stance both for defence and for catching passing prey. 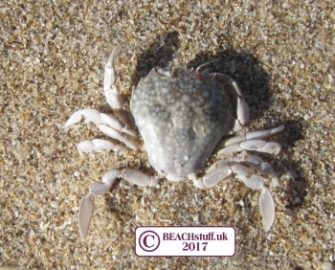 The Porcelain Crab has an almost round carapace with proportionately very very long and broad pincers. 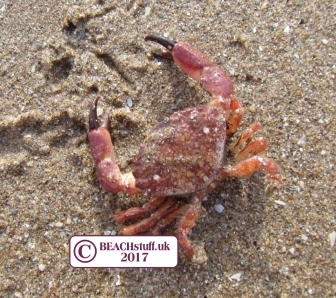 It is a small crab, only growing to about 1cm across. 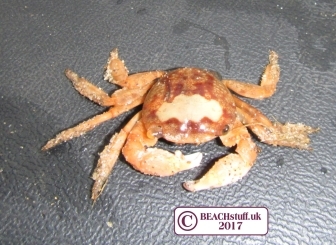 This small (up to 4cm across) crab has very large paddles on its back legs which make it an excellent swimmer. You won't be surprised to learn that it doesn't actually fly, but it is a very good swimmer. This crab is sometimes confused with the Harbour Crab which looks very similar but has a row of white on its upper carapace. This crab is not dissimilar to the Flying Crab (see above) but can be distinguished by the white spots in two curved lines half way down its carapace. 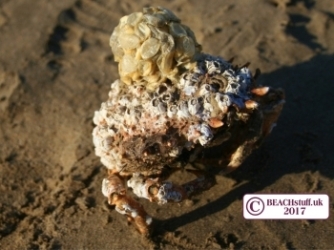 The orange colour in this specimen is not unusual in beached crab shells which have been hanging around for some time. The original crab was probably a much duller shade. 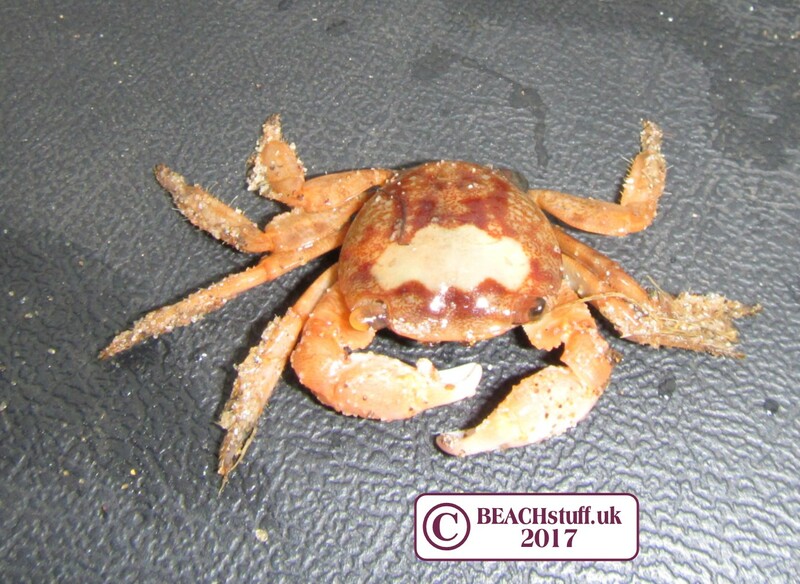 Also known as Henslow's Crab, this crab is found out in the deep Atlantic swimming near the surface of the sea where it feeds on squid, fish and other crabs. You can see how good a swimmer it is by the huge paddles on its back legs. 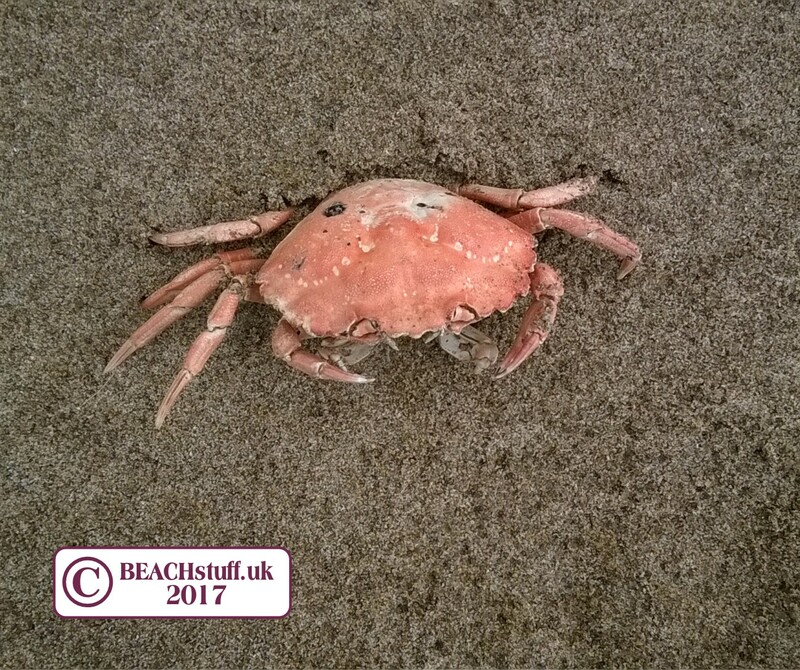 It is unusual to find one on the beach but Oliver did just that at Saunton Sands in North Devon. Hermit crabs are not usually seen like this - they normally have a sea shell for protection. This one may have perished having left his shell (perhaps to try a new one for size) or may have died and then fallen out. He was a fine fella when he was alive though. 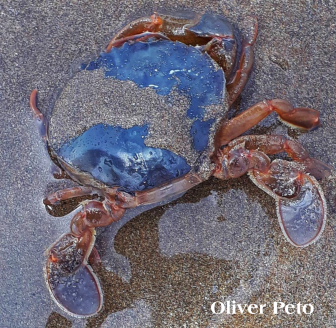 Below is a video of a smaller, but very much more alive hermit crab. 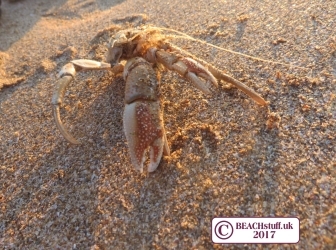 Lobster are related to crabs, all being crustaceans (along with prawns and shrimps - as well as woodlice and barnacles). When they are alive, they are this bright blue colour. 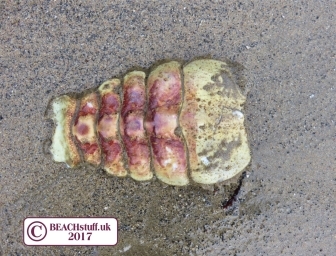 Their shells, or parts of the their shells (like this tail that Christine Keay found) often wash up as they are discarded when the lonster moults. 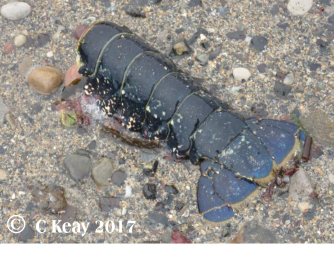 When a lobster is cooked, they turn pink like the tail shell below which was chucked back on the beach. Still not sure? Have another look at some of the most common carapace shapes. The broadest, in relation to carapace height, is the edible crab, far left. The tallest, in relation to its breadth is the masked crab. far left. 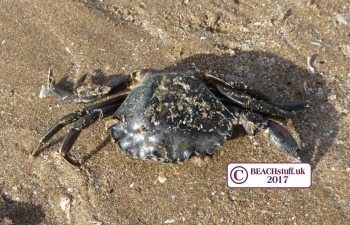 The pincer of the edible crab is distinguishable from others by its very broad structure, orangey colour and the black teeth of each pincer. These claws tend to look more 'muscular' and strong than other claws and this one in the photo is a whopper - as big as my hand. A pimply claw with a purple/bluish hue is generally the pincer of a velvet swimming crab. Another pimply claw - this time in beige and brown and orange. Quite a flat pincer, roundish in appearance. 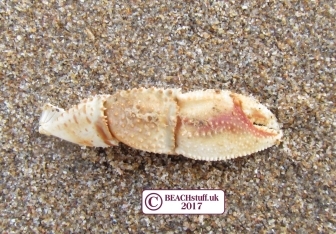 The common Hermit Crab will have just one claw like this - the left is smaller and narrower. The legs of spider crabs are very long and thin with dainty black points at the end of each. They may, if not bleached by the sun, still have patches of orange. Like its legs, the pincer of spider crab is recognisable as it is so long and thin. The pincers themselves are quite smooth and pointed. This particular claw is now covered in barnacles. While the pincer of the Masked Crab is long and slender like those of the Spider Crab, it is not quite so pronounced - not as long and not as thin. Looking at them together (spider crab pincer above), the difference is quite noticeable. A bit more practoce might be needed out on the beach. This is the abdomen of a crab - most likely an edible crab. It is this flap which lifts up in a female crab when she is carrying eggs underneath it. 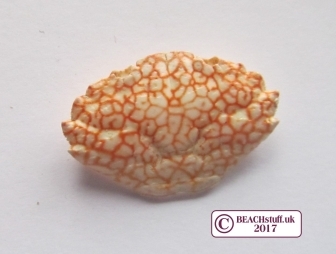 This small carapace was about 2.5 cm wide at its widest point, bleached white and beautifully laced with bright orange lines. 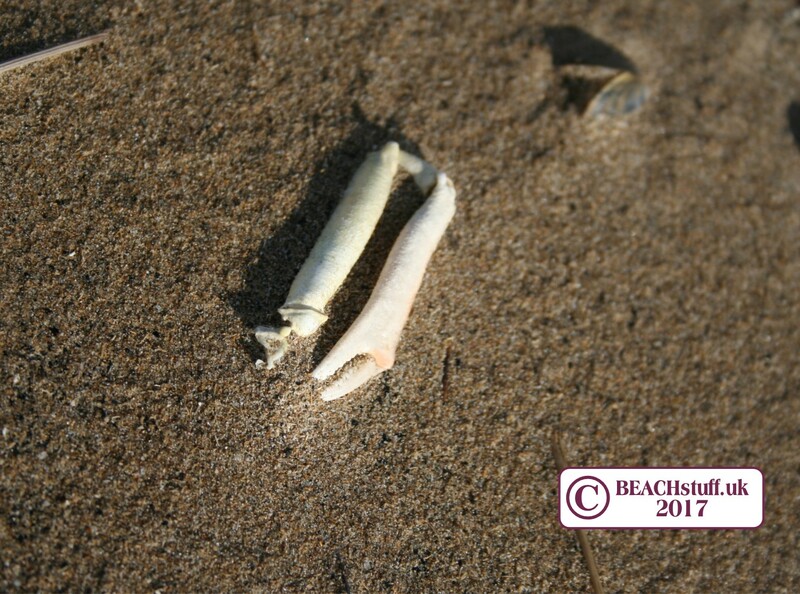 Email hello@beachstuff.uk and we'll feature your ideas and any photos you send. Or perhaps you have a photo you'd like to submit for the next challenge.